Look out, here come the Knights of The Old Republic at last. 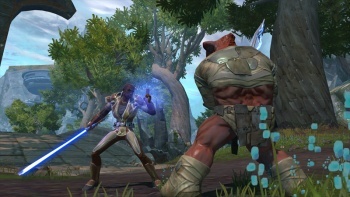 We all knew this one was coming - in fact, the only real surprise in BioWare's reveal of the Jedi Knight class for Star Wars: The Old Republic is that four other classes were announced before it. It may have been a long time coming, but the Jedi - and the lightsaber - are perhaps the most iconic image there is of the Star Wars universe, and certainly the defining image of BioWare's KotOR games, so it's nice to see a proper reveal at last. The Jedi is the third Republic class to be unveiled thus far, joining the Trooper and the Smuggler as the good guys. Assuming the pattern continues, the next of the three yet-to-be-revealed classes will be a dastardly member of the Sith Empire alongside the Bounty Hunter and the Sith Warrior. As for what else there could be ... unfortunately for Penny Arcade's Tycho, my guess is that there probably won't be a Protocol Droid class, but I could see the Sith getting an HK-47 clone of their own. It's interesting that they specify "Sith Warrior," so I could also imagine a caster-type Sith as well. You know, kind of frail physically, but able to rip your spine through your nostrils with a wave of his finger. We can speculate all we want about the three remaining classes - and feel free to - but right now there's just one class in the spotlight. So, what does the HoloNet have to say about the Jedi Knight, Guardian of the Republic? A symbol of hope in dark times, the Jedi Knight stands for the legacy of the Jedi Order-more than twenty-thousand years of protecting the Republic and keeping the peace across the galaxy. Though Jedi Knights have served as generals, guerilla fighters, and warriors for generations, their legendary combat prowess faces its greatest test during this age. A source of inspiration to allies and intimidation to adversaries, the Jedi Knight's presence is welcome in any confrontation. The Order's long history of fighting for justice has earned the trust of countless friends and the hate of innumerable enemies. Few, though, are foolish enough to challenge a seasoned Jedi Knight unless they have the skills and technology to even the odds. The Jedi's dark counterparts scored many victories during the war, expanding their Empire, and putting the Republic on the defensive. Since the Treaty of Coruscant, the Sith have consolidated their military might, even while the Jedi have withdrawn to Tython, a move that's been looked at with suspicion by many of the Republic's politicians. Nonetheless, the war is far from over, and the Jedi Knight's resolve remains firm. With unwavering allegiance to the Republic and the light side of the Force, the Jedi Knight fights with valiant determination, wading into the thick of any battle to protect freedom and democracy and hold fast against those who oppose it. For many, the Jedi Knight is the guardian of a precious dream; a dream of peace, a dream of justice, a dream of a brighter future. The fate of the galaxy depends upon the Knight's ability to keep this dream alive. Cool stuff. Unless the fourth Republic class is really, really awesome, I have to say I see myself going with the whole "Jedi" thing. If only so I can make lightsaber noises to myself while I play.